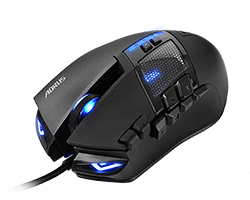 All 5 mice below are ideal for MMO games and support remapping of buttons to any in-game action required. 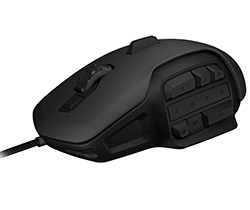 All but the Logitech G303 Daedalus Apex come with multiple thumb buttons allowing for the remapping of many actions. The Roccat Nyth takes that concept one step further and allows you to remove or combine buttons physically on the mouse. The Nyth offerers the most physical customisation of all the mice listed. You can remove (or add) buttons to the side of the mouse using the provided button inserts. If you are really keen you can order customer 3D printed button inserts to go that extra step and make the Nyth fit your needs perfectly. The software is also great for mapping your most commonly used actions to the closest button. This Mouse would best suit a person who will get to the effort to maximise the potential offered. The Thunder M7 offers a different take on the thumb button set-up, this allows you to have a more natural grip without the fear of accidentally pressing one of the thumb buttons in the heat of battler. The software is probably not so advanced as many of the other brands but still does a decent job. The Naga has gone through a number of iterations culminating in the Naga Epic Chroma. This is the only wireless mouse I chose as I do not believe that wireless gaming mice are the best choice for many gamers. More often than not I forget to put the mouse back in the dock to charge and find myself rushing for the cable to connect it straight to USB during gaming sessions. However, the Naga Epic Chroma is one of the best choices out there and would be perfectly at home with any gaming set-up. 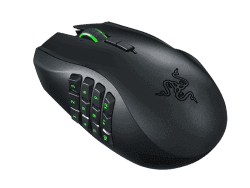 The Scimitar is the newest of the 5 mice and sports an adjustable thumb button placement. This allows you to slide the position backwards or forwards, allowing you some customisation of button placement. This helps when trying to reach the last column of buttons on the thumb button grid layout. As with all these mice, you can customise the button actions through the corsair CUE software. This is the simplest mouse out of the 5 and is more about the sensor than the physical features of the mouse. 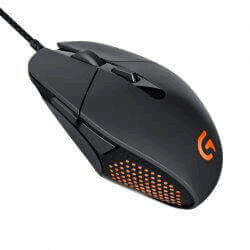 For those gamers wanting a light and agile mouse and who doesn't want or need all those buttons to deal with this is one of the more stripped down approaches. There are many mice that would fit this style, I chose this due to being a newer mouse that would be an interesting choice as a present.